I’ve had a lot of queries and concerns from Hammersmith and Shepherds Bush residents after my brief reference in the last eNews to the proposal to divide this constituency at the Goldhawk Road, with the areas north and south going into different Parliamentary seats. Between now and 11 December is the second, and effectively the last, chance to comment on the proposals for new Parliamentary boundaries by the Boundary Commission for England, and I’ve been asked to provide a guide for those wishing to comment. I wrote about the original plans in March of this year. Under the previous proposal, the Borough would have been split into three, with Shepherds Bush merging into an Ealing seat, Hammersmith joining up with south Fulham and College Park & Old Oak tagged onto Willesden. I objected to these proposals and put forward my own scheme. About 600 residents supported me as against 200 who preferred the Commission’s plans. Last month the Commission responded by putting forward a revised proposal. Unfortunately, the new plans, though different, have many of the same faults as the original. Now all of Shepherds Bush will be merged into Willesden in a seat stretching from Goldhawk Road and Stamford Brook Road up to Wembley on one side and Kilburn on the other. I have submitted a fresh objection which you can read here. You are welcome simply to agree (or disagree) with my arguments or to make your own points. Comments can be made here and can be as long or as short as you like. – The Boundary Commission has shown partiality in acknowledging the support from Kensington & Chelsea for keeping that borough together while dismembering H&F, without giving similar weight to the views expressed here. 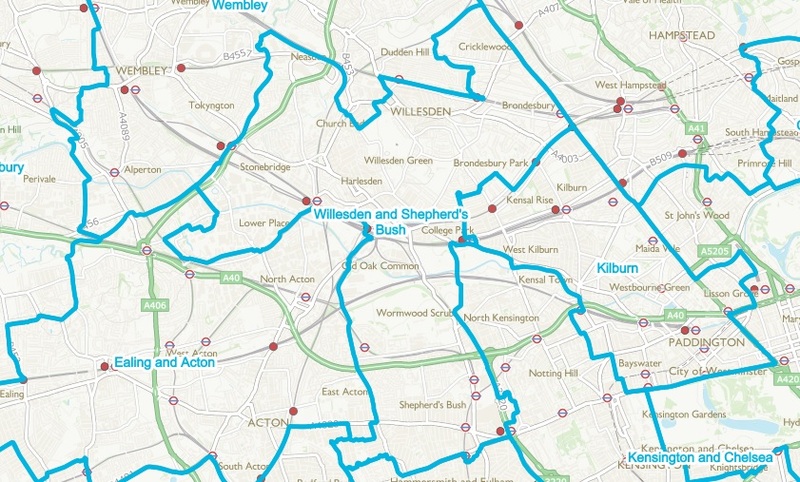 – Shepherds Bush would be the junior partner in the new Willesden and Shepherds Bush constituency. There are poor transport links north to south. We do not share councils, NHS, fire or Police services. – Hammersmith and Shepherds Bush belong together. Communities, residents’ groups, even families straddle the Goldhawk Road. We use the same shopping centres, theatres and public services. And for my own part, it is an absolute pleasure to represent the whole community here, and I do not wish to have to opt for one part over the other. P.S. The Commission do listen to residents’ views, so if you run a local group or just know other local residents who may not be on my mailing list then please pass this on.